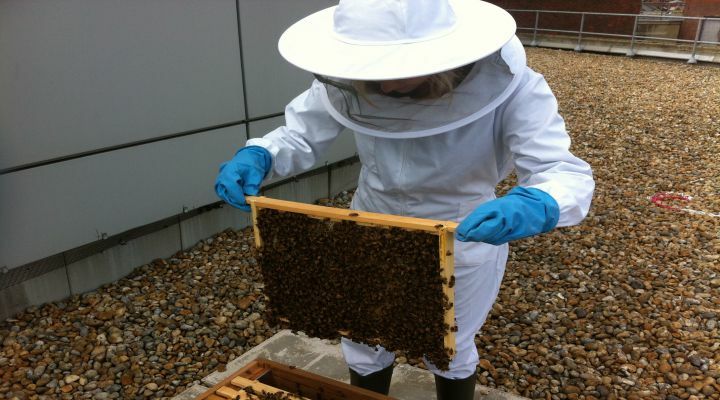 Early April saw the eagerly awaited Oracle bees arrive on site and settle into their roof top hive as part of The Oracles biodiversity plan. The bee’s arrival was a steep but very exciting learning curve for the five newly trained beekeepers (comprised of Hammerson, Shield and GBM staff). Reading Beekeepers provided plenty of advice in the early stages and allocated a mentor who was an invaluable phone call away on a number of occasions. One such occasion during prime swarm season resulted in the formation of a second hive of bees. To ensure that the project has been inclusive to as many staff as possible there have been opportunities for those interested to join beekeepers during inspections of the hives. This has provided an informal way of educating an increasing number of people about how incredibly intelligent, fascinating and invaluable they are. Although honey is not always guaranteed within the first year of beekeeping, next week will see the harvest of the first Oracle honey! It is anticipated 50 jars of honey will be generated and donations for the produce going to charity.